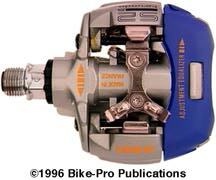 At the middle of 1993 LOOK released their S2 pedal sets. 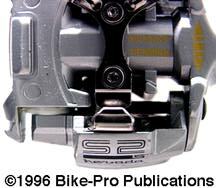 The S2 pedals are LOOK's response to the success of Shimano's SPD system and their desire to recess a small cleat into the sole of the rider's shoe. 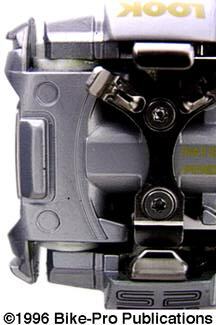 To make use of the Shimano style, LOOK adopted the hole drilling pattern that Shimano uses for the SPD system. Any shoe that is directly capable of having an SPD cleat mounted and recessed within the sole is also capable of doing the same with a LOOK S2 cleat. Having the same hole drilling pattern is referred to as "Shimano compatible", which is the shortened form the full term of "Shimano compatible drilling". 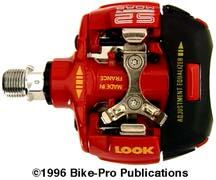 Shimano cleats will not work with this pedal!! The S2S Nevada is the Sport model with springs that can adjust the cleat release tension to let go at between "5 and 14 Newtons per meter", (the term Newton per meter appears to describe .1375 Kilograms-meters or .9945 foot pounds). 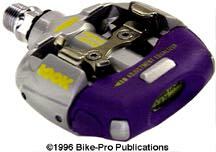 The S2S Nevada pedals use the same spindle and bearings that are used in all the LOOK road pedal models, with two insignificant changes. The spindle and its bearing are covered in the LOOK overview, the difference is that the spindle is bright chrome plated, and the plastic locknut has been replaced with another plastic one (threaded the same) that requires a LOOK specific tool (LOOK # 144724). The new tool is an improvement over the 18mm open wrench end used previously, which sometime slipped and stripped the plastic locknuts gripping sides away. 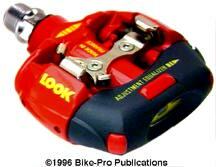 The tool however isn't included with the pedals. The S2 pedal is made primarily of three cast aluminum parts, the body and then two interchangeable pieces that form the heel or toe cleat retention clamp.